The Washington Post didn’t respond to my print circulation marketing challenge, but I just subscribed to The Washington Post Sunday print edition anyway. Why? I don’t think print newspapers are dead — they just need to radically evolve. But evolution is a process that has to start somewhere, and I want to understand better where print newspapers actually are. And the only way to do that is to read a print newspaper on a regular basis. I’ve been thinking about ways to frame the evolutionary process for print newspapers — one that states the goal, not just the problem. Chris: What we’re learning now, in an era where people have choices, is that the job of every print publication is to add value to the web. If you’re a newspaper, and I say this as someone who loves newspapers, arguably you are a value-subtracting medium. The same product, 18 hours later, that leaves smudgy ink on your fingers. This is not an indictment of the value of print newspapers conceptually — it’s an indictment of newspapers that are still publishing the same content on paper as they are publishing on the web.Newspapers used to see the web as a complement, a value add to the print edition. Now they have to flip the equation. The web is at the center, and the print newspaper must add value, as a complement. But that doesn’t mean the print newspaper should become merely a reference point or marketing vehicle for the web. It means making sure that all of the precious, expensive, resource intensive column inches in the print product complement what is more easily and efficiently published on the web. The future of print newspapers is a zero sum game — column inches, staff resources, and capacity to print and distribute are all limited. Nothing in the paper can be there because it’s always been there — everything needs to be rejustified, or reinvented. Each week when I receive the Sunday Post, I’ll be offering comments on what actually complemented my reading of WashingtonPost.com, what was duplicative, what was a complete waste of resources and, ideas about what’s missing. I’m just one reader, of course — but my intent is to bring the debate about the future of print newspapers out of closed editorial meetings and into the open. To be clear, this is isn’t an anti-print publication attitude — our house is filled with magazines. And it certainly isn’t anti-Washington Post — my wife is a very avid reader of WashingtonPost.com. 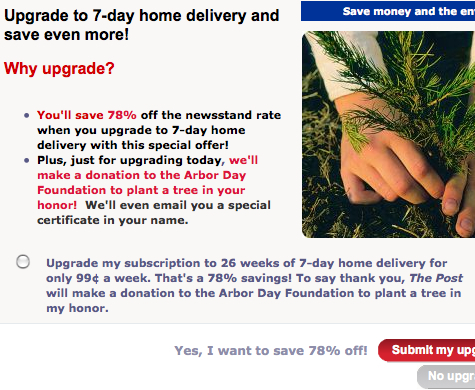 Now there’s a circ marketing idea — subscribe (not just the upgrade) and we’ll plant a tree. Of course, that doesn’t compensate for the barrels of ink, or the gas for the delivery trucks, or the exhaust from those trucks… etc. And the final irony would be delivering such an subscription offer by postal mail — on a piece of paper. Oh well — despite all that, I’m eagerly looking forward to my first issue of the Sunday paper, which I plan to read on the couch, with the laptop shut down and the Blackberry off (OK, well, maybe not that… got to take this one step a at a time). And I intend to plant a tree.